Slim-lined, CE-certified shoulder and elbow/forearm protectors feature skin-side channeling for improved flexibility and airflow as well as excellent protection from impacts. Newly designed, back panel features triple-layer, perforated EVA compound padding for good shock absorption and padding. Back protection is CE certified to the latest Level 1 standard. CE certified Level 1 shoulder and elbow PU foams offer new softer formulation and channeling design for improved flexibility. 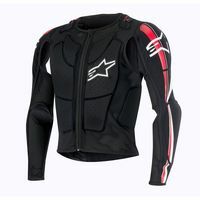 Removable upper chest and back padded panels accommodate Alpinestars BNS. Premium, auto-locking YKK zips for main frontal closure and on detachable sleeves to ensure secure fitting. Convenient, soft touch silicon pull tabs on shoulders for secure fitment of Alpinestars BNS.